the fish, the birds and the sea"
mine was the sea, from a very young age." 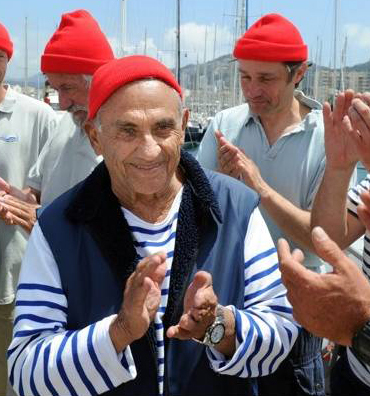 ﻿﻿﻿ Albert Falco, who sailed alongside Jacques-Yves Cousteau for almost 40 years as the French underwater explorer’s principal diver and as captain of Cousteau’s ship, the Calypso, died on the 21st April 2012 at his home in Marseille, France. He was 84. I didn't know Albert Falco in person, but I felt I knew him from the books and TV shows I watched in the 60's as a boy. This man was living my dream, to dive the oceans of the world from a ship built to film and record the wonders of the sea. I knew every word from The Ocean World of Jacques Cousteau books back to front, I knew every episode of ﻿The Undersea World of Jacques Cousteau﻿﻿﻿ ﻿and I knew Albert Falco as the Captain of Calypso. Step forward two decades to 1990. By coincidence this same year that Albert Falco retired after 40 years with the Cousteau Society, was the year I was invited along on a Cousteau Society expedition on the wind-ship Alcyone. During the Rediscovery of the World TV series filming the Dugongs of Shark Bay in Australia. This same year Jacques Cousteau's wife Simone died at 71 years of age. Simone Cousteau and Albert Falco were known to be the closest of friends onboard Calypso. Simone was given a full military funeral and her ashes were scattered over the sea of Monaco. At Albert Falco's funeral, the theme music from The Undersea World Of Jacques Cousteau was played, while the flag of Calypso was draped around his coffin. He once said "In order to be happy, one must have a passion in life - mine was the sea, from a very young age." Captain Jacques-Yves Cousteau realized his dream of capturing the wind to propel a ship when, in 1985, from La Rochelle, France, Alcyone (Daughter of the Wind ), crossed the Atlantic and arrived triumphantly in the port of New York. Her missions have taken her all the way down the Americas to Cape Horn, then along the Pacific coast to the Sea of Cortez (Mexico) in 1986, where the crew watched a school of fin whales feeding, then elephant seals being tagged in the Channel Islands (California) in 1987 and, in 1988, attempted to follow the migration of humpback whales from the Hawaiian islands to Alaska. In 1989, Alcyone arrived in Papua New Guinea. In 1990, she studied Australia's great white sharks, explored Madagascar in 1994, and met more white sharks off Namibia in 1996. In 1998, she documented the status of the enclosed Caspian Sea; it was the first time in forty years that a foreign vessel was authorized to enter the sea. She traveled to her US home in Virginia for much-needed maintenance on her Turbosails, then left for the St. Lawrence River in 2000 to observe conditions of marine mammal exploitation. In 2001, Alcyone returned to her home port, La Rochelle, for a complete overhaul, including new engines. The Alcyone home port is now Concarneau, Brittany, France. Mr. Falco, who learned to swim almost as soon as he could walk, was known as a master diver, mariner and ecologist long before he teamed with Cousteau in 1952. They joined forces that year when Cousteau was leading an underwater excavation of two ancient shipwrecks near Mr. Falco’s native Marseille. From then on, the two Frenchmen were constant companions on ocean going voyages that took them around the world the equivalent of 12 times. The angular, patrician-looking Cousteau became internationally celebrated as the public face of oceanography and marine conservation. But the stocky, unflappable Mr. Falco was the sunburned seafarer who efficiently kept Cousteau’s mission afloat. Mr. Falco was featured in " The Silent World ” the 1956 Academy Award-winning documentary made by Cousteau and director Louis Malle that introduced much of the world to the wonders of ocean life. 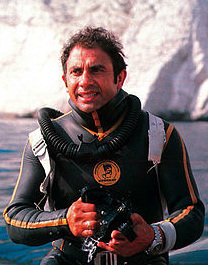 The film was an early call for ecological awareness, although Mr. Falco said he and Cousteau were not conscientious stewards of the sea at the time. He said they sometimes killed vast numbers of fish with dynamite and allowed other animals to die in order to get better footage. By the late 1950s, however, Cousteau and his crew became more sensitive to the environmental dangers facing animals and plants in the sea. More than anyone else, Cousteau was able to draw attention to threatened marine life and to the beauty of the deep through scores of books and a television series, “The Undersea World of Jacques Cousteau,” that was broadcast around the globe. He made almost 100 films, including three that won Academy Awards. When Cousteau devised watertight capsules to descend to the ocean floor, including the diving saucer, Mr. Falco was usually at the helm. In 1980, he piloted a submersible vessel that found a U.S. warship that had sunk in Lake Ontario in 1813. On other expeditions, he descended to the ocean floor, capturing remarkable images of little-known species of plants and fish. In 1962, Mr. Falco and another diver spent a week underwater in a Cousteau experiment of living on the ocean floor. Their underwater house contained beds, a toilet, kitchen, electric lights and a television, and doctors went down each day to check the divers’ health. Albert Falco was born Oct. 17, 1927, in Marseille, and within 18 months had learned to swim. He and his father often went boating and diving in the nearby turquoise inlets and coves. “Ever since then, water has been a natural element for me,” he said. Mr. Falco retired in 1990 but continued to make environmental films and work with conservation groups until shortly before his death. Captain Jacques Cousteau died in 1997. Mr. Falco lived in recent years in Marseille and on the Caribbean island of Martinique. Survivors include his wife, Maryvonne; a daughter; and four grandchildren. lead an extraordinary life..... he has no right to keep it to himself"